In the video below we hear vocal mixing techniques from 3 World Class Engineers: Cameron Webb, Bob Horn, and Bob Marlette. Check out Mixing Motörhead with Cameron Webb to get the multitracks and mix the song for yourself! Bob Horn demonstrates how a fast release time on your compressor brings your vocal up front. He uses DeEssing to control the Esses and Tees then uses a Multiband Compressor to control High Mid aggression, followed by EQ Boost and additional cutting of unwanted high mids. Check out Anatomy of a Mix with Bob Horn & Warren Huart to get the multitracks and mix the song for yourself! Bob Marlette shows us how he uses effects like the Kramer Tape Delay to give his vocals added interest, then adds high end EQ going into compression. Next he uses reverb swells to create drama as the song transitions from the Verse to the chorus. Even though this is a Rock song the Chorus vocal, like a Pop song is triple tracked to get the Vocal wide over HUGE electric guitars! 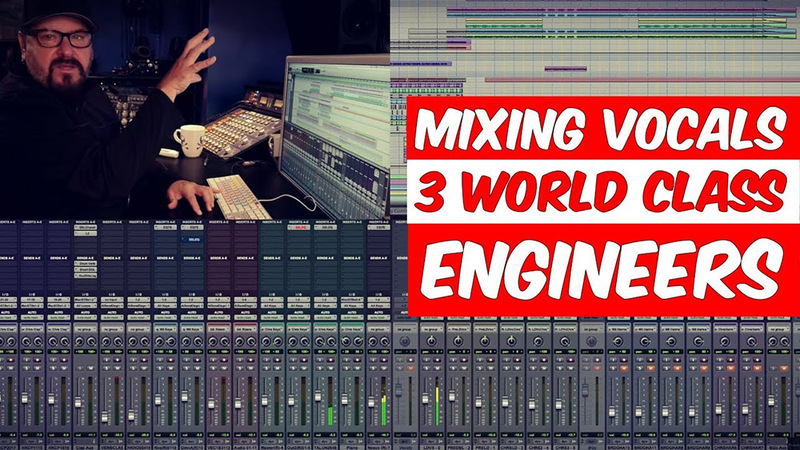 Check out Mixing Modern Rock with Bob Marlette to get the multitracks and mix the song for yourself!